During the 2014 Atlantic hurricane season, NASA is redoubling its efforts to probe the inner workings of hurricanes and tropical storms with two unmanned Global Hawk aircraft flying over storms and two new space-based missions. Collecting and sharing the data help protect the United States and nations of the Caribbean. NASA’s airborne Hurricane and Severe Storm Sentinel, or HS3 mission, will revisit the Atlantic Ocean for the fourth year in a row. HS3 is a collaborative effort that brings together several NASA centers with federal and university partners to investigate the processes that underlie hurricane formation and intensity change in the Atlantic Ocean basin. The NASA Global Hawks are unmanned aircraft that will be piloted remotely. They are well suited for hurricane investigations because they can fly for as long as 26 hours and fly above hurricanes at altitudes greater than 16,700 meters. The NASA–Japanese Space Agency Global Precipitation Measurement (GPM) mission, launched February 27, will provide rainfall measurements every three hours around the globe and will complement the HS3 mission. The ISS-RapidScat instrument is slated for launch to the International Space Station in August. RapidScat will measure ocean surface winds in Earth’s tropics and midlatitudes and will provide useful data for weather forecasting of marine storms. 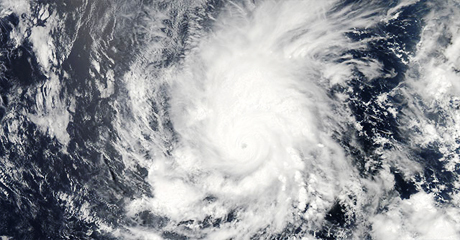 Shown above is Amanda, the first named storm of the 2014 hurricane season in the Americas, off the west coast of Mexico in an image acquired May 25 by NASA’s Aqua satellite.